This study was conducted to determine the exact point when the noise in a restaurant setting causes vocal discomfort for customers. Another aim of the study was to identify customers’ willingness to spend time and money in a restaurant depending on the varying noise level in the environment. 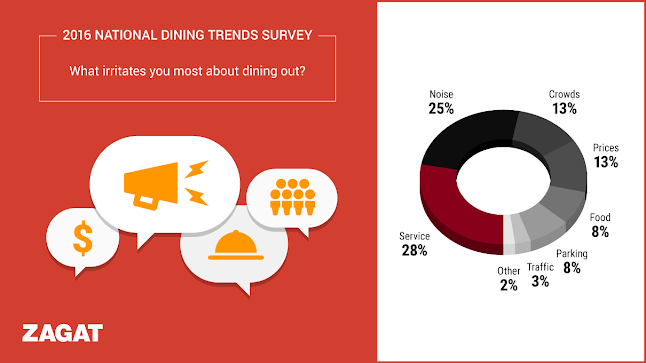 According to the 2016 Zagat State of American Dining report, 25 percent of restaurant customers consider noise the most irritating component of dining out (Figure 1). The Lombard effect is when speakers unconsciously increase the loudness level of their speech in the presence of background noise in order to be understood. This requires increased vocal effort and can cause vocal fatigue over time. In a restaurant setting particularly, background noise created by other patrons’ conversations is more likely to trigger the Lombard effect than other types of background noise  (Figure 2). Previous studies have demonstrated that uncomfortably loud levels of background noise can result in decreased customer satisfaction and business for the restaurant [2, 3]. The Lombard effect has been investigated in a variety of environmental settings with different types and levels of background noise. However, little is known about the level of background noise that will cause the Lombard effects in restaurant settings. 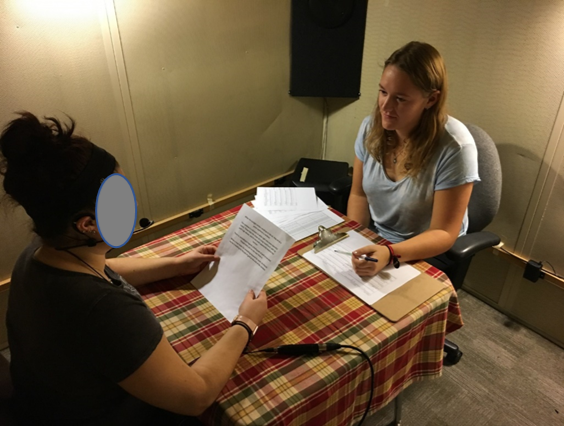 For each noise condition, the participants were then instructed to answer questions about the disturbance they perceived from the noise, how long they would enjoy spending time in this restaurant setting, and how much money they would spend at this restaurant. The results showed that both participant vocal effort and disturbance increased as the background noise level increased. Reported willingness to spend time and money at a restaurant decreased as the background noise level increased. 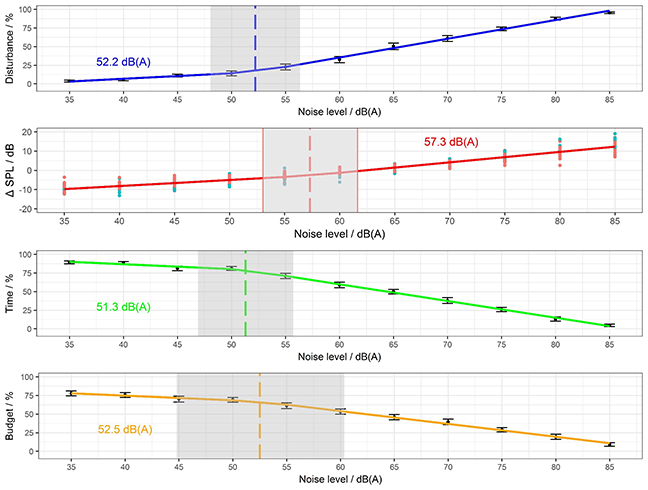 The participants started to be disturbed at noise levels higher than 52.2 dB(A) (Figure 4, blue line). Because of the disturbance in the communication, participant vocal effort increased at a doubled rate as the background noise level increased (Figure 4, red line) for noise levels higher 57.3 dB(A) (approximately the level of normal conversational speech). Similar noise levels to the one that starts the communication disturbance (51.3 dB(A) and 52.5 dB(A)) also trigger a decrease in the willingness to spend time and money in a restaurant (Figure 4, green and yellow lines). In conclusion, to improve the acoustic environment of restaurants, background noise levels should be lower than 50-55 dB(A). This will minimize the vocal effort of patrons and the disturbance in their communication. Concurrently, this will increase business for the restaurant since patrons would be willing to spend more time and money to eat in a restaurant with a background noise lower than 50-55 dB(A). Figure 4 Relationship between the level of the noise in dB(A) and self-reported communication disturbance (blue line), relative voice level (red line), willingness to spend time (green line) and willingness to spend money (yellow line), where the error bands indicate the standard error. Vertical dashed lines mark the change-points. A. Astolfi and M. Filippi, “Good acoustical quality in restaurants: a comparison between speech intelligibility and privacy,” in Proceedings of EuroNoise (2003). C. C. Novak, J. La Lopa, and R. E. Novak, “Effects of sound pressure levels and sensitivity to noise on mood and behavioral intent in a controlled fine dining restaurant environment,” Journal of Culinary Science & Technology 8(4), 191-218 (2010). W. O. Olsen, “Average speech levels and spectra in various speaking/listening conditions: A summary of the Pearson, Bennett, & Fidell (1977) report,” American Journal of Audiology 7(2), 21-25 (1998).